Find your inspiration, find your people. Flickr is home to billions of photos and millions of groups of passionate photographers. Organization and sharing made simple. Browse with ease, select and organize hundreds of photos with one gesture, and share in seconds. Unleash your creativity. Edit your photos, add filters, crop images, and more! As an active Flickr member, I follow the Flickr Explore rather closely. I’ve observe that the first 50 or so spots are always reserved for a small “elite” group of photographers. Whenever those photographers post pictures they will be in Explore at the top spots. One can say that those are outstanding photos and deserve to be on Explore and I have to give you that. Now for the rest of Explore spots, I found that they usually goes to the newer members or to the members with very little activities. They have very small number of follower and following, rarely viewing and faving other member’s works. I understand that getting the newer members on Explore is a great encouragement, but at the same time it also encourage some members to be inactive for it will increase their chance to be on Explore. It also left out many of us who stay active but have little or no chance to get on. 500PX has a Popular category. In order to get to the front of the Popular page, a photo needs to has many likes. Other than having a great photo, to get more likes one has to like other’s photos. I think that is a much more positive approach, to get everyone involves, not the other way around. We all want our photos to be on Explore. Can’t it be more fair and let everyone has a chance as we all need encouragement. I have 12,000 photos uploaded to Flickr. None are public. 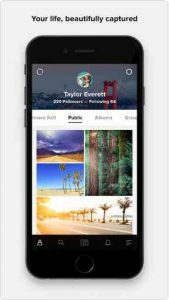 I use Flickr as a storing app just to store my photos so I can save space on my phone, camera, and computer. You can choose to make your photos and albums either public or private. You get 1 TB of storage. You don’t have to pay for it, or watch ads, etc. You get that much storage right from the start. I have 12,000 photos uploaded and I’m only using around 3% of that storage! All of my life’s photos are stored on here. Baby pictures, pictures of my art and writings, pretty much ALL of my childhood photos, selfies, photos of my pets, etc. My Flickr account and what’s on it is my pride and joy. I feel safe storing these photos on here just for me to enjoy. Flickr is easy to use, free, organized, and there’s no pop-up ads. No ads at all I think (remember, I only use Flickr privately).